It’s one of those Sundays when I am shockingly free with NOTHING to do so I sit in the TV room and do what I do best when in here – channel hop. I stop at Zee, the Indian channel and am just in time to start watching Life In A Metro. I’m glad I didn’t change the channels this time around. I really enjoyed this movie. The basic plot is that the lives of a group of people, who live in Mumbai are told in this tale, which revolves around Rahul – who occupies an apartment owned by his uncle, and lets rich and influential people use it for their personal sexual past-times. An ignored and angry young wife, Shikha falls into the arms of a young man named Akash, who wants to be an actor for Indian movies; then there is Shikha’s sister, Shruti, who is having an affair with a man named Monty; and finally there is Shikha’s teacher, Shivani, who is romancing Amol. Things get complicated when Rahul finds out that Neha, who is his girlfriend, is using this very apartment to meet with Ranjeet, who is Shikha’s husband. You’d think with all these different plots and too many people you’d somehow get disinterested but seriously it doesn’t happen. Personally it was interesting to see how people just screw around to get something out of life…. be it sexual, emotional or whatever. Is this the true state of what life has really become? The most enjoyable thing about the whole movie was watching my favourite music director Pritam with his band. 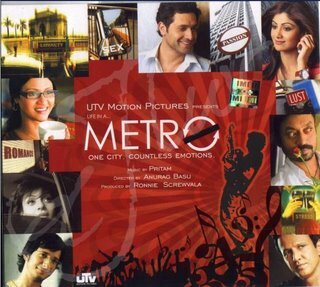 In the film, a rock band led by Pritam plays at important junctures and takes the story forward; this is considered to be a first in Indian film. The entire music score in Metro is heavily rock-oriented. The four-member band along with Pritam, also included Suhail Kaul, Soham Chakraborty and Bangladeshi singer James. The soundtrack is totally amazing and my favourite song is In Dino. I spent mine lazily bummed out on the couch! I insist I must do yoga at some point to kick out the laziness! Not watched the cool movie though. Sounds fun. I’ll try to love the sports less. Ok. That’s necver happening. I like this step to your own site. Moving forward.